I have been itching to fill a blank area surrounding this large urn filled with seasonal flowers. I added the Egyptian metal items over time, but the boring gap really bugged me, especially during the winter. It is the view I see right from my home office and art studio – an artful opportunity ready to happen. Thanks to Paint + Pattern I was able to create a much prettier vignette for July featuring our hot-color annuals in spectacular bloom. 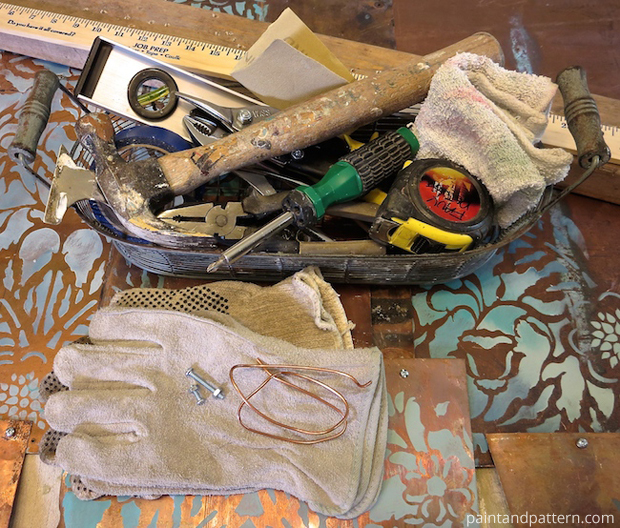 Originally, I had planned to order a perfectly cut piece of stainless steel to stencil, but the day I started the project, I just could not make myself do plain! So off I went, all alone, to the giant salvage yard here in town. It is unlike anything you’ve ever seen. Having visited often, I knew the ropes. 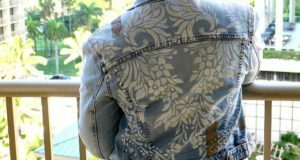 Two posts on my blog MyPatchOfBlueSky.com talk about patina junkin‘ and things you should know before starting this project. 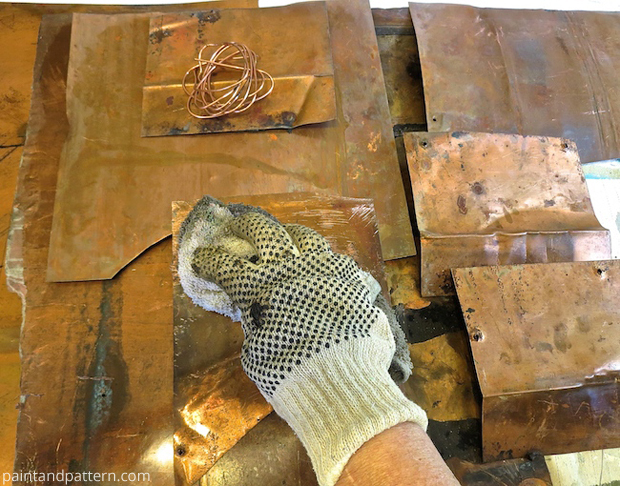 The first post shows how to find cool patinas strewn throughout the grime and filth. The second post covers my tips on what to wear and bring – especially for a female artist! A must-read before you leave home to go pickin’. I have a blast when it comes to creating metal art. There are no rules and I find it so relaxing. Not to mention, men creating Man Caves, love it. All five of the pieces I created were sold to one client the minute he set eyes on them. 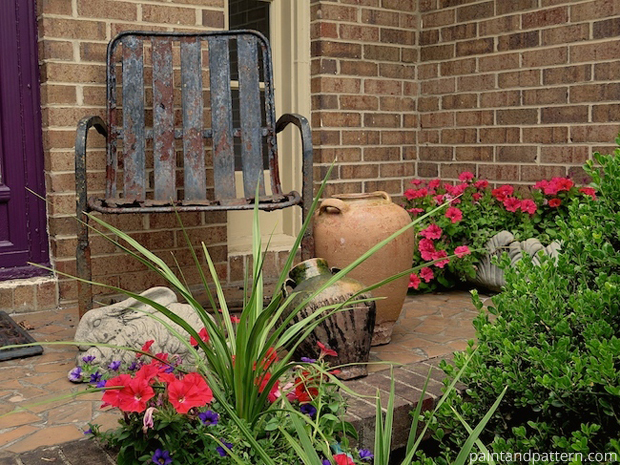 As you can see on the front porch, I do love a touch of rust around the house! So let’s jump in. 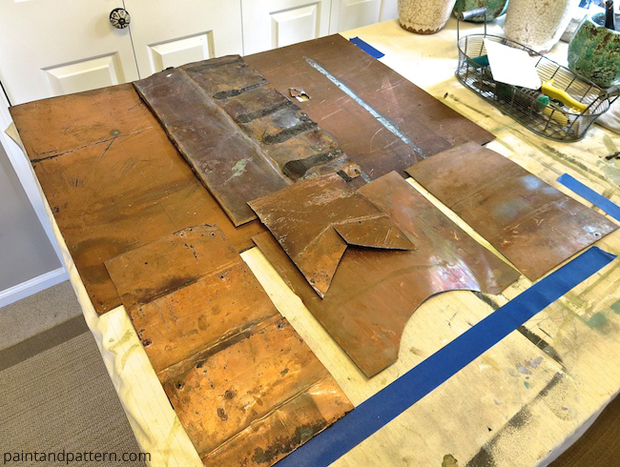 Naturally, your masterpiece will depend on the shape and size of the metal pieces you find. Even though it might not look anything like mine in the end, you can pick up the basics of construction from here for sure. We will not be cutting any metal, so you can just concentrate on designing with the pieces you fall in love with. At the salvage yard I wore heavy work boots and I spent some time bending and stomping on my pieces to get them rather flat. At home you can do more flattening using a hammer. Clean everything with water, wearing gloves and wipe dry. Use the 5-in-one tool to scrape of glue, tar or anything stuck and ugly. If necessary, measure the area you want your artwork to fill. 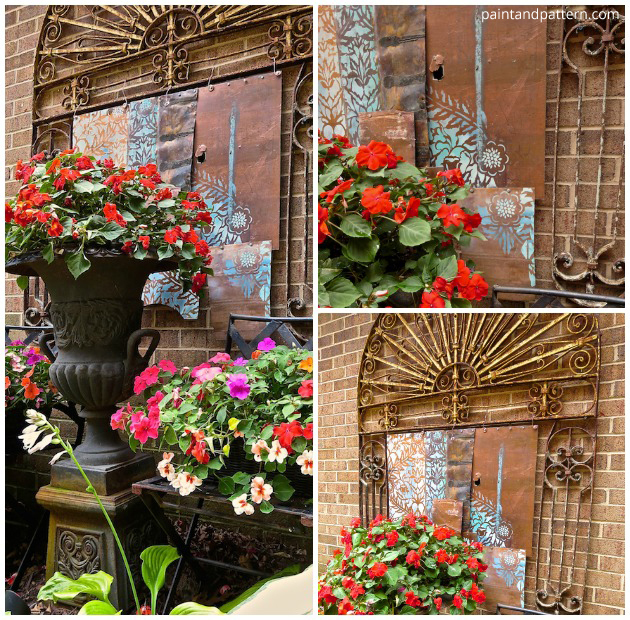 I had to fit my metal artwork inside an existing decorative Egyptian scrollwork on our exterior brick wall. On a work surface, tape off the area you want to stay within. Lay out your pieces until you are happy with the look. I chose to have a straight line at the top because I would be hanging the artwork from a straight metal bar. Take a picture on your phone or camera for later reference in case you forget your layout. 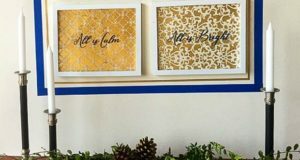 Cut your yardstick or wood scrap just short of the top width of the artwork. 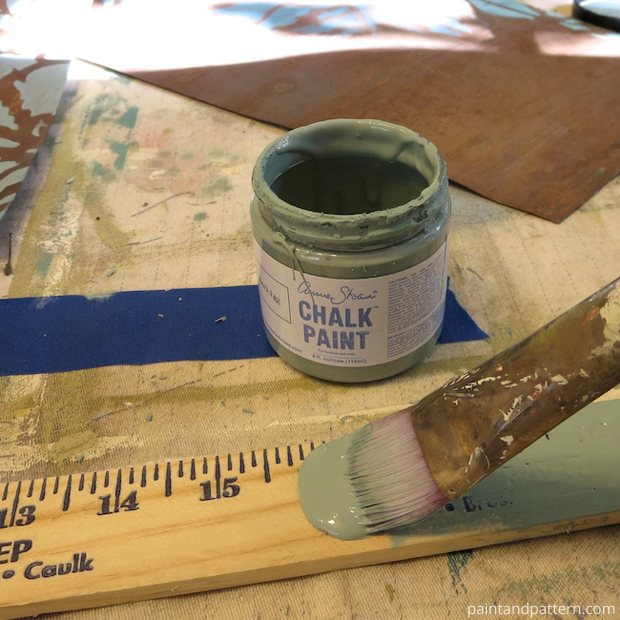 Paint two coats of any color Chalk Paint® and let dry. This will serve as an anchor to hold the top edges together. 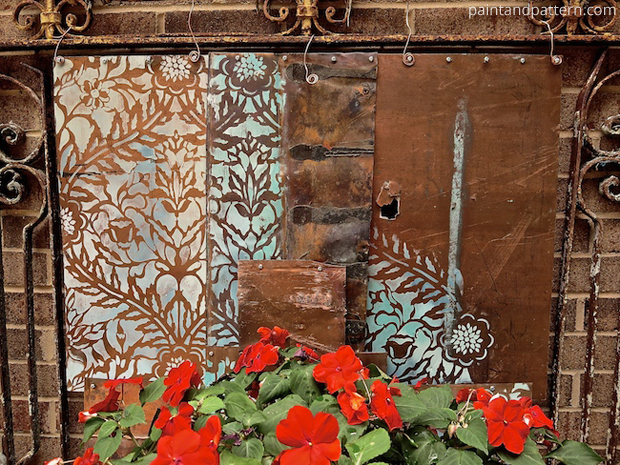 In any order you like, stencil on select areas of each metal piece where you want a pattern. I used very random colors, blending here and there using just one brush for all colors. 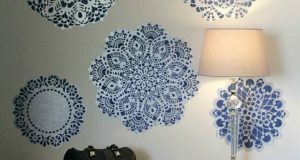 I simply held the stencil in place with one hand and stenciled away in a swirling motion. 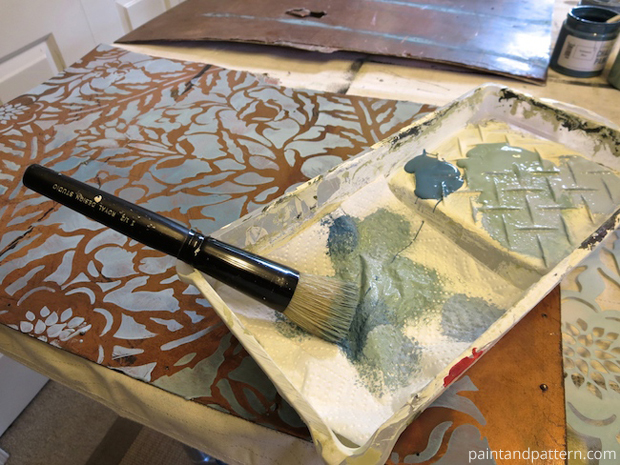 Just be sure to tap off excess paint on paper towels after dipping the brush in paint. Starting at the top left of the taped area, place a large piece of wood in position at the very edge. Lay the painted wooden piece directly on top. Over these two pieces, place your first of three metal pieces. Drill holes into this “sandwich” near each end of the metal piece. You can add more holes every few inches if needed. Through each hole, thread a screw long enough to allow room for a matching nut on the backside. Add the second metal piece on the far right, drill holes and attach with nuts and screws. Using the same process add the third piece in the middle on top of the two metal artworks. Now you have the building blocks for the metal pieces that will drop down. Just move the wooden piece down to where you want to drill (so you have something to drill into versus your surface) and keep adding holes and screws. TIP: If you want some dimension so that the entire piece does not look like it is a flat surface, add a longer screw between two surfaces to create a gap. Cut several lengths of copper wire about 6 inches each. 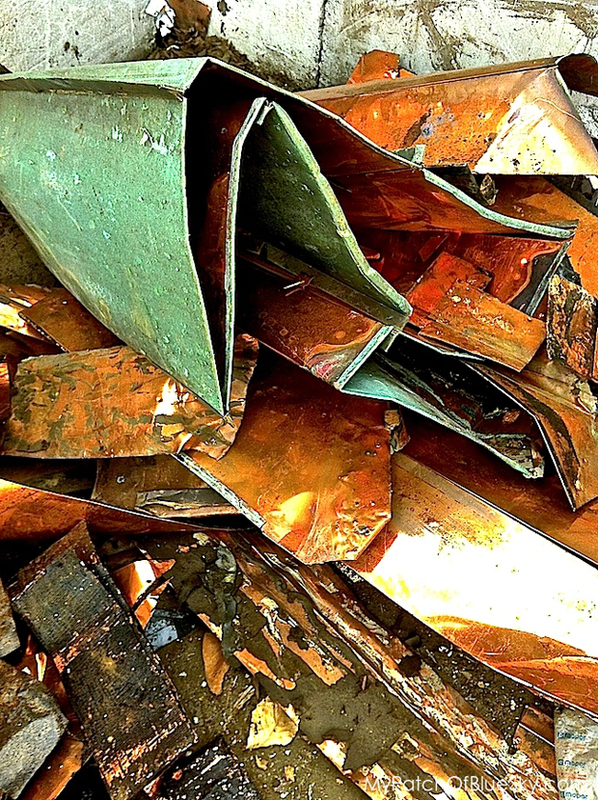 With pliers in one hand, grab the end of the copper and twist it around the pliers a couple of times. Place the loop under the top screw as shown in the photo and tighten. The loose end will loop over the straight bar of my outside Egyptian metal. Invite an adult helper, both of you wearing gloves. Hold each end of the artwork in position. Both of you loop the end of the copper wire over the horizontal bar, leaving the same amount of “air” space. Do the same for the rest of the copper wire. Use pliers to tighten the wires as needed. I love the fact that this will age nicely and blend in even more with the Egyptian framework over time. 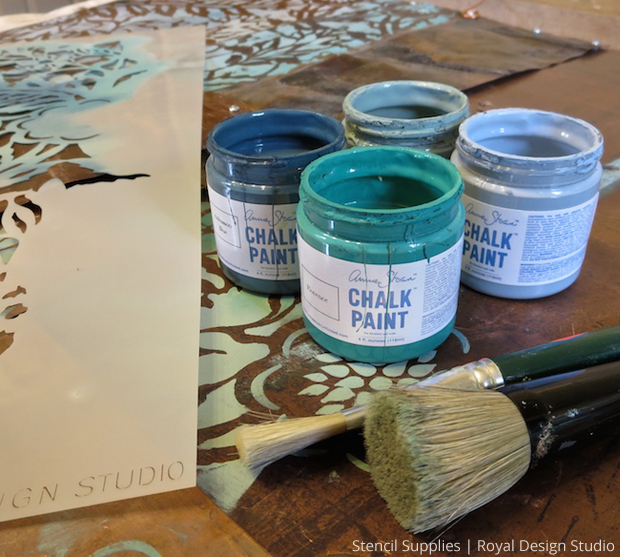 Who can imagine life without gorgeous patina – either real, or created with a stunning Royal Design Studio stencil and the perfect paint colors. 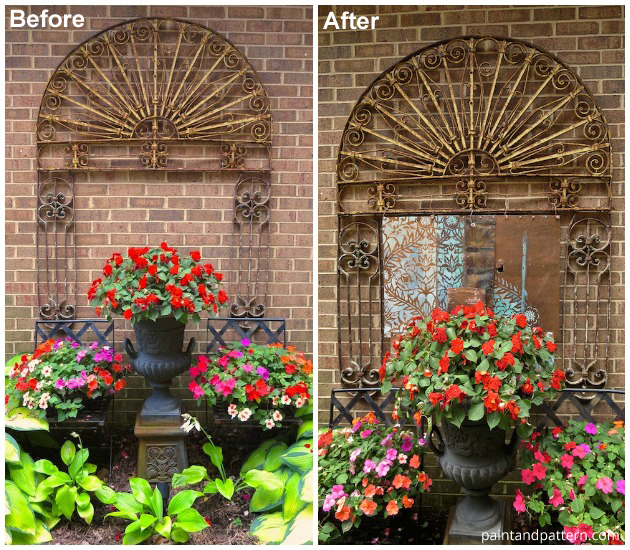 Love an adventurous project? 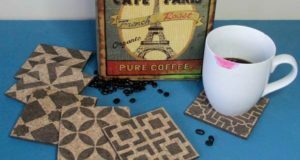 Stay tuned to Paint + Pattern for amazing DIYs. 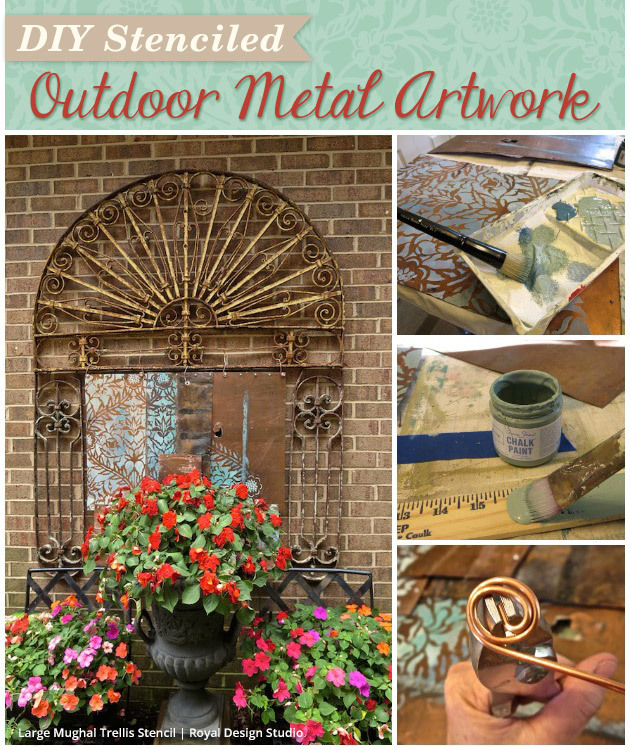 What outdoor stencil project are you doing this month? We would love to see it so do email your projects to us at projects@royaldesignstudio.com or share your pictures with us on our Facebook page. Beautiful! I could see men loving metal pieces for man caves! Hmmmm. Our basement is becoming a media room because it’s the only room big enough for the big TV, and metal art would fit with all the manly-looking stereo equipment.